Article - Take Control of your Broadband Future | Strategic Networks Group, Inc. In this article we look at how communities and regions with inadequate broadband services can take control of their broadband future. Much has been written on why this is clearly important for your community vitality and economic well-being. It is also clear that many municipalities and counties, especially in rural America, continue to lack 21st century broadband with no realistic prospect for this to be addressed by commercial service providers. We are talking about not only the FCC recommended minimum of 25 mbps down / 10 mbps up, but gigabit service for the future. It is very common for communities to have two primary service provides – a cable operator and a telecom/DSL provider – typically serving the densely populated core areas and leaving many residents and businesses without an adequate and affordable option, or any option at all. There is a very basic reason why this status quo is not addressed by commercial providers. There is little incentive for them to further invest in upgrading or extending their networks. The business case payoff is just not there. They have already captured the most lucrative portion of your market. This is not a criticism of commercial ISPs – that is just a business decision. To change the broadband status quo requires municipalities to take the initiative – but how? Many communities that have considered this problem have concluded that if the commercial ISPs will not provide the needed service quality and coverage, then the municipality or county will need to create a new network to provide broadband service. The traditional approach follows a model of becoming a new service provider that competes with the incumbent ISPs. This can be done as a community broadband network or by building a new network through a municipal utility and, in fact, a number of municipalities have done this, albeit with mixed success. A driving goal behind building a municipal network is to provide broadband to currently unserved or underserved areas. These tend to be less densely populated with a higher cost per subscriber, which is why they are not served now, so implicitly you are taking on a market that drives down profitability. In order to make the investment financially viable, you will need to capture market share in the more profitable areas already served, which means directly competing with the incumbent providers. You are serving a market of fixed size (your municipality) as the last entrant into an already served market fighting for a slice of the pie. While you may have the support of the community and a better service, you will not have the economies of scale and the deep pockets of the incumbents. You will need to invest in network build out in advance, even if it is phased, in order to get subscribers and revenue. Your focus will need to be very much on marketing and achieving take rates in a competitive environment. You will need to do all of this in the face of political backlash and taxpayer resistance over municipal involvement in the commercial market, which will be further fueled by strong resistance from the incumbents that don’t want to lose customers. Municipal broadband networks are often characterized as unfair competition by “stacking the deck” with municipal investment. On top of all this you will need to develop the competencies of a service provider to compete with incumbents that have these core competencies – it is their only business. This assumes that you are even permitted to build and operate your own network. At this time 21 states do not allow municipal networks or have severe restrictions that limit this approach. It is conventional wisdom for any type of business that you never want to be the last one to enter a competitive market. It does not require a detailed feasibility study to realize that this is an uphill battle from the start, and in the end you become just one more Internet service provider. For many communities the traditional approach simply will not work, but what else can a municipality do? Can you meet your community needs for broadband while minimizing or eliminating the risks of the traditional approach? The answer is a resounding yes, but it does require a paradigm shift in how you think about municipal broadband. Broadband as infrastructure – First and foremost when considering municipal broadband think of it as essential infrastructure that enables not only internet access, but also provides a platform for innovation and many other services. Rather than being a mechanism focused only on bringing better internet connectivity to the community, a quality broadband infrastructure opens up opportunities for many other new services that benefit the community. Provide choice through open access – As a municipality your goal is not to become an internet service provider. Your goal is to ensure that everyone in your community can get affordable, quality broadband if they want it. By ensuring that your broadband infrastructure is open access you can provide the needed bandwidth while lowering the cost of entry to even more retail internet providers. You not only avoid directly competing with incumbents, you actually encourage more competitive choice from other providers. 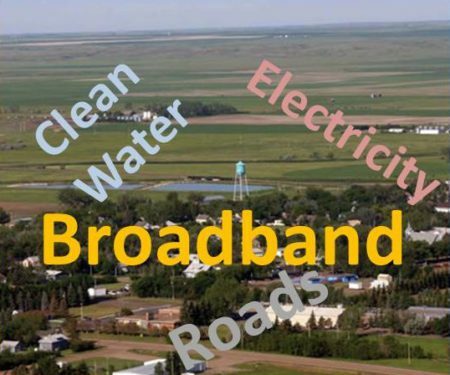 Build based on committed demand – In many cases, the initial investment in municipal broadband infrastructure can be justified by addressing the immediate needs of the municipality itself, connecting municipal facilities as well as community organizations such as schools and libraries. This core network can then be extended more broadly to neighborhoods that demonstrate a committed demand to pay for that investment. This last concept is a key paradigm shift that turns the traditional model on its head. You create a “win-win” by offering interested property owners the option to buy into the broadband infrastructure from the outset on favorable financial terms. With enough property owners opting in, they win by getting better broadband with open access choice of service providers, while the municipality covers the cost of the network build from committed users without becoming an ISP. The investment is paid for without implicating other taxpayers who choose not to opt in and without putting general taxpayer funds at risk. As a municipality, you are providing the option for connecting with essential infrastructure and having it paid for without needing to compete with incumbents and being consumed with driving take rates. What you get at the end is much more than the internet. You get an essential infrastructure that provides flexibility of choice for internet services as well as innovative services that can benefit the community as a whole. You have a platform to create and offer smart community services, enhance public safety, and open up opportunities for anyone to innovate and provide new services not even dreamed of yet. All of this can be enabled over a future-proof network that is dynamic and virtualized through open-access software that gives control to the user. If you really want to take control of your broadband future, then you need to do it in a way that aligns with your real goals with a sustainable, affordable approach that reduces risks. Your goal is not to become another internet service provider. That is only a means to an end constrained by the traditional approach. Your true goal is to ensure that affordable, quality broadband is available to everyone in your community who wants it. This can be done by taking a new approach enabled by current technologies and following a path that is the legitimate right and strength of every municipality – building essential infrastructure. A hope or a reality? This new approach to owning your broadband future is not simply a theoretical concept, but it is new. However, thanks to the pioneering work started by the City of Ammon, Idaho, there is a real and successful model to follow. In fact, the “Ammon Model”, as it is becoming known, is an exemplar of the open access virtualized network infrastructure approach that many other municipalities can learn from and follow. Ammon has made the paradigm shift toward owning their broadband future that we have highlighted in this article and the Ammon Model is gaining increasing attention for its novelty and achievements. Any municipality that is continuing to come to terms with its own broadband future can benefit from looking at what is happening in Ammon.